Inside the Villa lot of important books, collections and archives are collected and preserved. 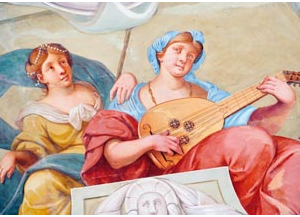 The present library of the Villa does not include Marco Contarini’s (1632-1689) ancient collections which are presently kept in the Biblioteca Nazionale Marciana in Venice. In fact, the actual library is the result of the social and economic renewal carried out by Paolo Camerini (1868-1937) in the area of Piazzola since 1890. He chose to make his residence the home of works of art and important literary collections, probably pursuing the dream to bring back the stately building to the splendor of the Baroque age, and thus increase the prestige of his family name. Therefore, Paolo Camerini gave great impulse to the book collection and, in order to provide it with a larger and more prestigious location, he had a vast part of the east wing of the Villa readapted as a library, keeping the Swing Room for the “Modern Library”. Contacts with other libraries and with antique book dealers, made possible by the Count’s considerable wealth, made his book collection increasingly rich and important. This heritage remained unaltered even after Camerini’s death in 1937, and survived even the Second World War. 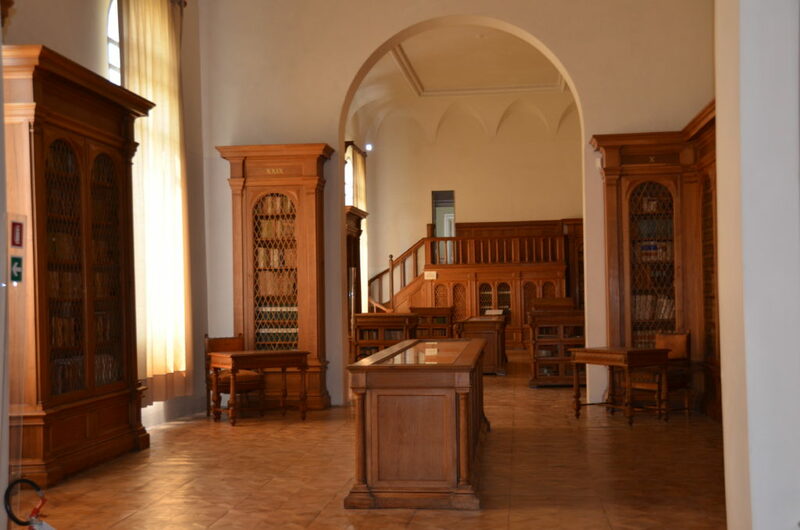 A part of it was lost after the conveyance of the Villa in 1950.Today the library still consists of five rooms which were initially decorated with Renaissance stacks, but were later refurnished by architect Tito Corsini in 1930. In 1969 the whole building and its grounds were bought by Professor Giordano Emilio Ghirardi, and the stacks were sealed to avoid further violations; moreover, books and magazines on medicine and health-care coming from the Simes company, whose owner was Ghirardi himself, were added to the library. Today, the library hosts precious 16th and 17th century editions, as well as a great number of 19th and 20th century books on various subjects, such as law, philosophy, Italian and international literature, geography, modern and contemporary history. There are also many collections of pamphlets dating back to a period from the 17th to the 20th century. They are particularly interesting as they often make direct reference to local Venetian history, and in particular to the history of Padua. Since 2005, the Region of Veneto, after taking over the estate, has committed to a project of reorganization and classification of this extraordinary book heritage. The collection of maps and drawings, hosted in the Instrument Room and in the adjacent rooms, includes documents dating back to a period from the 16th to the 19th century and regarding estates related to the Villa or belonging to the families of its owners. It mainly consists of two sources, Contarini (15th-19th centuries) and Camerini (19th-20th centuries), as well as of other documents regarding a short period during which the Villa belonged to Correr-Giovanelli (or Giovannelli?) (1837-52) and Bergami (1955-58). Moreover, the collection includes some documents regarding Silvestro Camerini’s businesses before he purchased the Villa (1852). Land measurements and hydraulic maps, notorial deeds, legacies and testamentary provisions are part of an extraordinary heritage on the history of the Villa and its grounds, as well as the studies on the topography and hydraulic works for the land reclamation of the territories adjacent to the Brenta river. The archive includes: 478 letters, 200 files, 350 maps studied and edited in 1994 by Gianna Suitner. 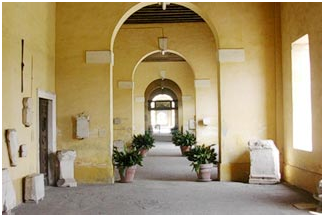 The Epigraphic Museum is situated in the eastern colonnade and contains the remains of an ancient collection started by Antonio Nani in the early 18th century, and continued by his sons Bernardo and Giacomo. 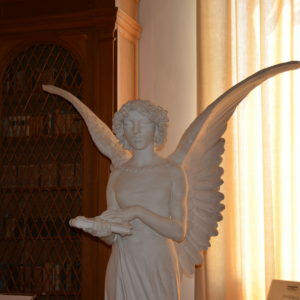 The collection, resulting from the passion of the Nani family, included statues, coins and especially a great number of Greek and Latin historic, votive, and honorary inscriptions and epitaphs. They were all collected during the offices of Antonio as Provveditore Generale della Serenissima (General Superintendant of the Republic of Venice) in Morea, and of Giacomo, first as Almirante delle Navi, and then as Provveditore da Mar della Serenissima nel Levante (Sea Superintendant of the Republic of Venice in the East), in Istria, Dalmatia, in the Ionian isles on the East in general. Giacomo’s death one month before the fall of the Republic (1797) marks the end of the collection, which was entirely dispersed and sold by his son Antonio in 1822. The collection was thus dispersed in Europe and in the United States. 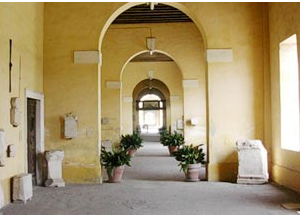 Pietro Businello, a friend of the family, bought the most sizeable part of it, consisting of about a hundred inscriptions and several statues, for his country house in Legnaro, Padua. In 1847, after his death, his heirs, the Pagani family, sold the collection in different consecutive times, further dispersing it. Most of the statues arrived to various museums in Saint Petersburg, Berlin, Budapest, Paris, Bologna, and Baltimore; a group of thirty-seven inscriptions, nine of which are in Greek and twenty-eight in Latin, was bought by the Camerini family and moved to their house in Piazzola, where they are still kept.